Robert McDermott ( Edenderry RFC } ex Predident of the Leinster Branch and, current Midland Representative to the Leinster Branch, with the help of Derrick Turner (Longford RFC) and present Manager of the LB Junior Interpro Squad, came up with a fundraising idea, which incorporated running a Junior Leinster Luncheon prior to a home Leinster Interpro. In order to bring the Junior Clubs on board they encouraged each Area to nominate a candidate for selection to the newly instigated Sean O’Brien Hall of Fame. These nominees hail from Leinster Junior Rugby. This is the second year of this process. 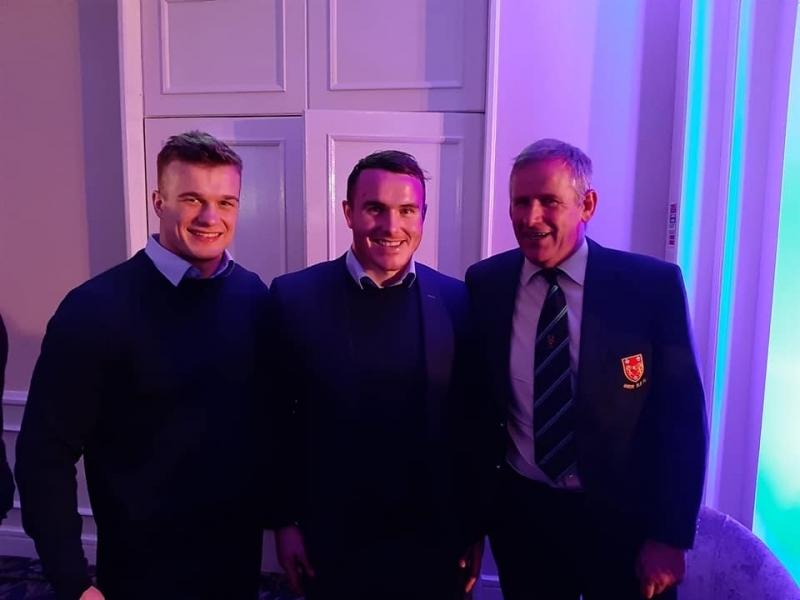 This year Peter Dooley (Birr RFC) and Conor O’Brien ( Mullingar RFC)were to be honoured by the Midland Area but Michael Lambe ( Mullingar) Chairman had a change of heart. The Clubs from Leinster Rugby are encouraged to take a table of 12 and this year there were 36 tables. To increase the revenue there is a raffle of some worthy memorabilia plus a Draw for a signed Leinster Jersey. Phil Lawlor kicked off proceedings by inviting Robert McDermott to welcome the guests who included the Birr Rfc party of David Baker, Willie Burns, Mick Coghlan and his son Mal, Des Corcoran and his son, Nicholas ,with his sister, Mary Boissel and brother in law Matt Ward. The Dooley Family, Ger and Martina, Their son, current Leinster Interpro Peter and daughter Sarah with Conor Murphy and Michael Colclough. The Club is indebted to the individuals who picked up the slack created by late withdrawals. As the luncheon was being served the various nominees were introduced to the gathering and the eventual nominee, a member of the well known Anderson Family from Athy RFC, was welcomed into the Hall of Fame by Sean O’Brien. Phil Lawlor then introduced Joe Schmidt to the gathering, and as the Guests worked their way through a four-course meal with wine of varied hues, presented Joe to a panel which included Sean O’Brien, Josh Van Der Flier and Peter Dooley for a Questions and Answers. This proved to be very entertaining as the answers to Phil’s probing questions were informative, erudite and amusing. After the meal etc we wended our way to the RDS where the Leinster team were impatient to have a ‘go’ at Ulster.Leinster had the bonus point in the bag by half-time in front of a very appreciative crowd that included a party of over 150 minis and parents under the supervision of the Club Welfare Officer and Coach Frank Higgins.